The flowers which are borne in abundance in spring, summer and autumn completely cover the bush and dance in any wind that blows. A truly delightful effect. 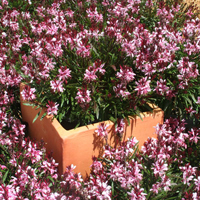 Gauras come to us from the plains of North America, Gaura. Flower borders in full sun where a touch of dainty blush pink brings the garden to life. Perfect in pots and baskets (as long as they can be watered and not dry out) around patios, on terraces and barbecue areas. 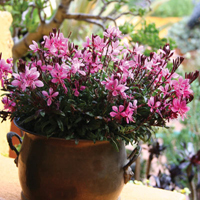 Basic care for Gaura will give you a few years of pleasure from your plant. After planting in your well draining fertile garden bed mulch around the plant and water it in. Very little water is needed from then on once your plant is established. 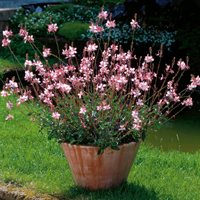 Once your Gaura has grown and flowered it will begin to look shabby and will need a prune back to encourage more flower to develop. Take all the top growth off leaving the crown. Apply a balanced fertilizer and water well, that’s all you need to do.